Hey everybody! Are you guys enjoying October so far? To me October feels like the kick-off to the best time of the year! The cool crisp air just makes me want to cuddle my family close and make memories together. I am big into tradition. When we were kids my mom did such a good job of instilling a sense of fun and anticipation when it came to holidays and family activities. When I think back on my favorite traditions, they were never super expensive or elaborate. Let’s be real, who has time for that anyway? 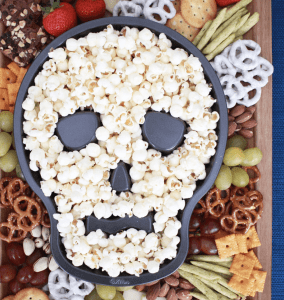 So today I thought I would share with you a few of my favorite easy Halloween traditions that don’t take too much time, money, or energy to throw together! 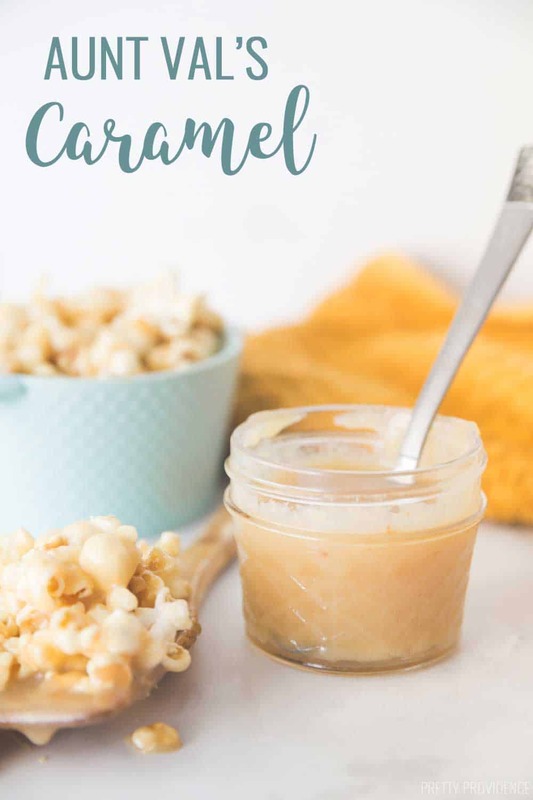 Aunt Val’s Caramel Popcorn Above anything else, this caramel popcorn is my favorite fall tradition from when I was little. ALL my friends came over when my mom made this caramel popcorn. It was literally famous. It does not get easier or more delicious than this recipe, and you will not regret trying it out.. I promise! 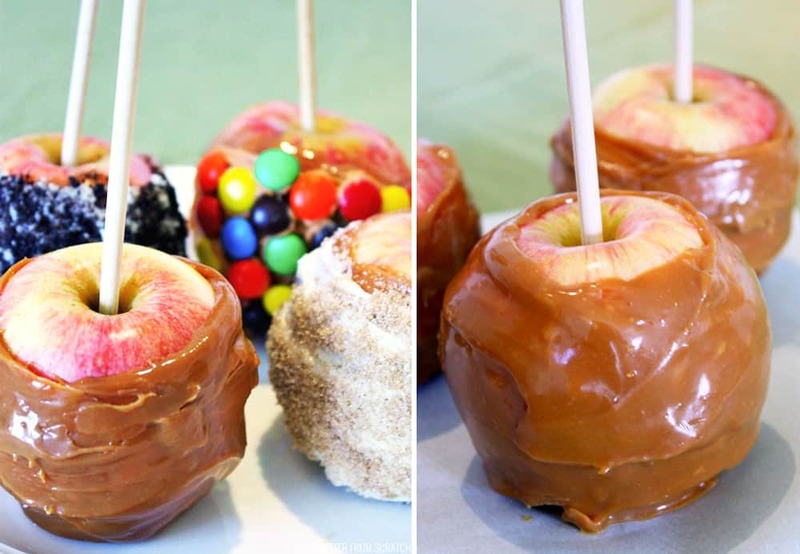 Gourmet Caramel Apples These apples are mouthwatering good. They just scream fall to me, and the best thing about them is that everyone can customize their own however they’d like! Or make a few different flavors and share slices, either way, this activity will please any group! 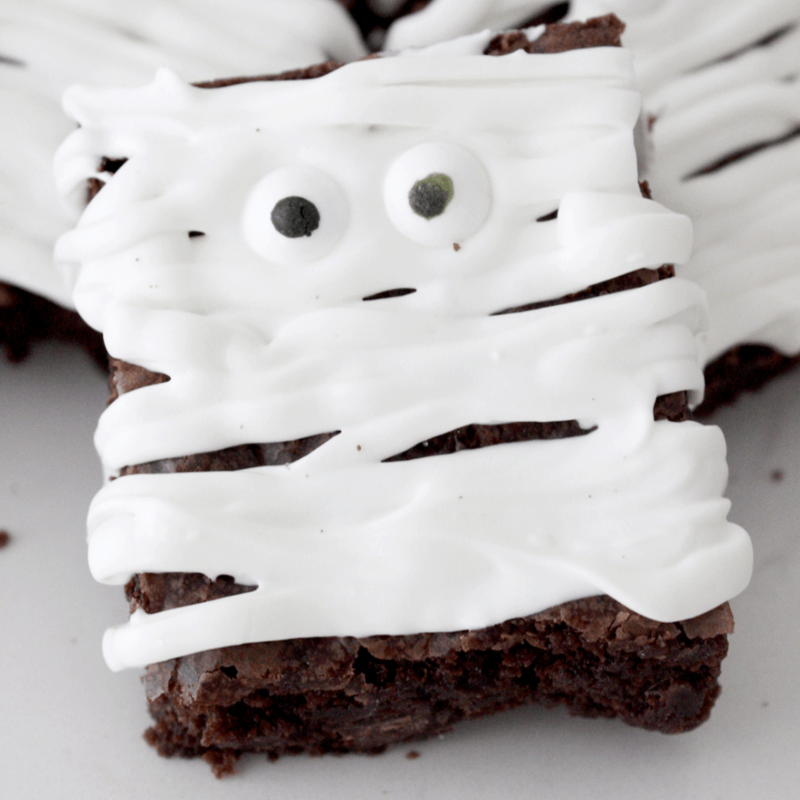 Also check out our page with all of our spooky Halloween treat ideas! “Boo” Your Neighbors I always love a chance to help my kids understand giving/sharing with others, and I especially love when doing so instills a sense of fun and excitement as well! I mean, what kid doesn’t love when door bell ditching is a parent approved activity?! This is a tradition that is new in my adult life, but anything that can get my picky eaters to try something new is a win in my book, haha. Make Halloween candy tote bags! My kids are currently obsessed with carrying things around in bags/backpacks. They take them literally everywhere I will allow it. If your kids are older, it would be fun to make their trick or treat bag together. I have never been huge into haunted houses, but I think corn mazes are such a fun alternative! They are usually cheaper, you don’t have to worry about wetting your pants when some bloody chainsaw guy comes out of nowhere, and it totally screams fall! Plus, you can do a corn maze with even the tiniest tots and they’ll think it is such a fun adventure! This Halloween Bingo is awesome for your neighborhood Halloween party, class parties or just family night! As much as I’d love to have my family dressed in perfect matching costumes, I just love seeing my little ones imaginations at work when they pick out what they want to be even more! Having little ones really does add the magic back into the holidays and I love how for one day Luke will get to be a superhero which is currently what he, “wants to be when he grows up”. So fun. 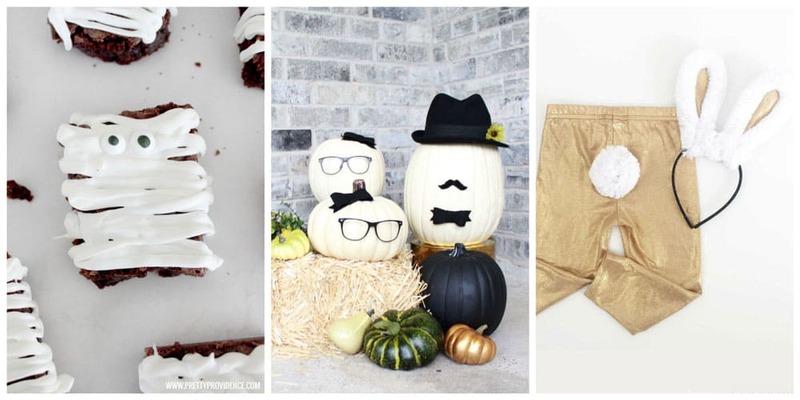 If you like to make DIY costumes check out all of our easy costume ideas here. Try making No-Carve Pumpkins like our Pumpkin People! Carve Pumpkins Not only do we love carving pumpkins (in our own, very amateur way) but we are lucky enough to live by Brooke from All Things Thrifty so we get to drive by and see their amazing pumpkin display as well! Any excuse to buy or borrow new books for my kids is a good enough one for me! My kids current Halloween favorite is “Room on the Broom” by Julia Donaldson, but we also love “Ten Timid Ghosts” and “The Little Old Lady Who Was Not Afraid of Anything” – all great reads! Is it even Halloween if you don’t watch Hocus Pocus?! Growing up we also always loved Casper, and Hotel Transylvania is a good one for little kids! 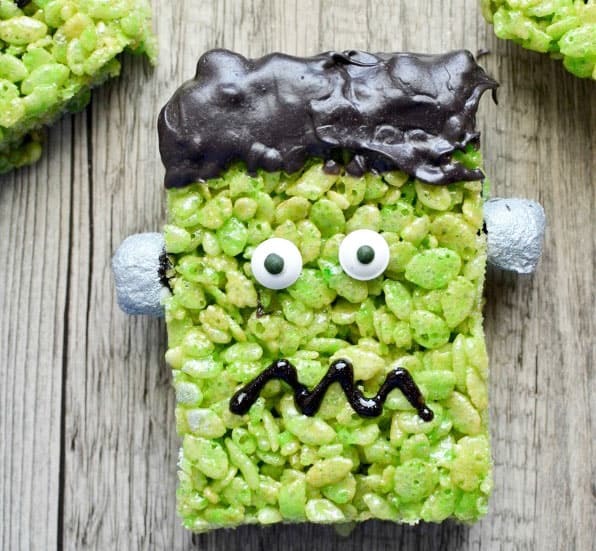 If you like this post be sure to check out all of the ideas in our Halloween Gallery! Fun ideas! Those totes are adorable! Thanks! Such fun ideas! 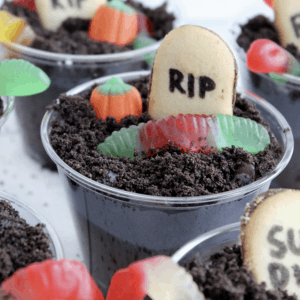 We love Halloween and I can’t wait to incorporate some of these fun things. Thank you! I hope your family loves them as much as mine does!